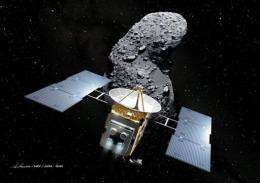 An artist's impression of Japan's space probe "Hayabusa" (Falcon) and an asteroid, called Itokawa in space. When Hayabusa was launched in 2003, the canister was open, meaning it may contain materials that originated on Earth, a JAXA spokesman said. But the agency added it remained unclear whether the particles are contaminants from Earth or come from Itokawa, which the space probe landed on during its multi-billion-kilometre (mile) journey. Hayabusa project manager Junichiro Kawaguchi said scientists believed materials from Earth were among the particles found in the pod. "But it's important that it wasn't empty... I'm glad that there is the possibility" that some are from the asteroid, Kawaguchi told a press briefing. Researchers have not fully opened the capsule yet but have found more than 10 specks visible to the naked eye, said another JAXA scientist, Toshifumi Mukai. Mukai conceded these particles may not have come from the asteroid. "I have a feeling that they are not cosmic dust," he said, adding that it was also possible that they were from deep space. Separately, an electron microscope found two more minute particles, estimated to be slightly bigger than 10 microns each, scientists said. One micron is one-millionth of a metre. When Hayabusa was launched in 2003, the canister was open, meaning it may contain materials that originated on Earth, a JAXA spokesman said. Technical problems plagued the journey of Hayabusa, which at one stage spun out of control and lost contact with JAXA for seven weeks, delaying the mission for three years until the asteroid and Earth re-aligned. After a seven-year space odyssey, the heatproof pod was fired back to Earth by the Hayabusa probe in June. Researchers at JAXA's Sagamihara Campus near Tokyo, have been opening the multi-layered canister in cooperation with US space agency NASA.